There were no cars in Victorian times so horses were the main source of transportation. This made a Hobby Horse or Rocking Horse a very popular toy with children, especially boys. While wealthy Victorian Children could afford the expensive rocking horse, the poorer children played with a Hobby Horse. 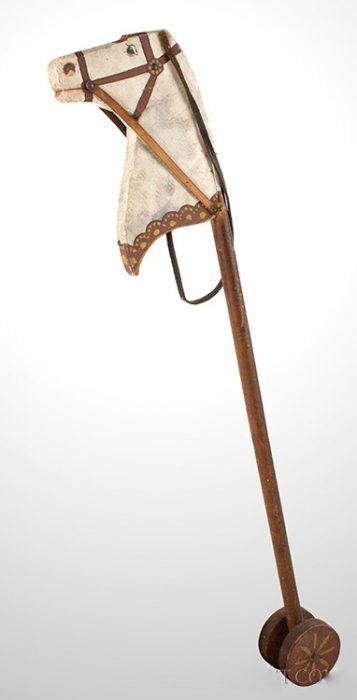 A Hobby Horse could easily be made by hand considering the body consisted of a wood pole or dowel rod. Sometimes wheels would be affixed to the lower end of the Hobby Horse so a child could roll it around and not just drag the wooden end along the ground. Even though they were much cheaper, Hobby Horses had the advantage of being mobile and could be used inside or outside, while the rocking horse had to stay in one spot while being ridden (usually inside). To quote Jim Henson, creator of the Muppets, "The most sophisticated people I know - inside they are all children". Which is why we, as adults are enamored with Toys. Presented here, a wonderful survivor in exceptional condition . . . A Toy Hobby Horse! Pennsylvania, 19th century; original paint, bridal and reins. Height: L 35": width: 9.5"; depth: 3".